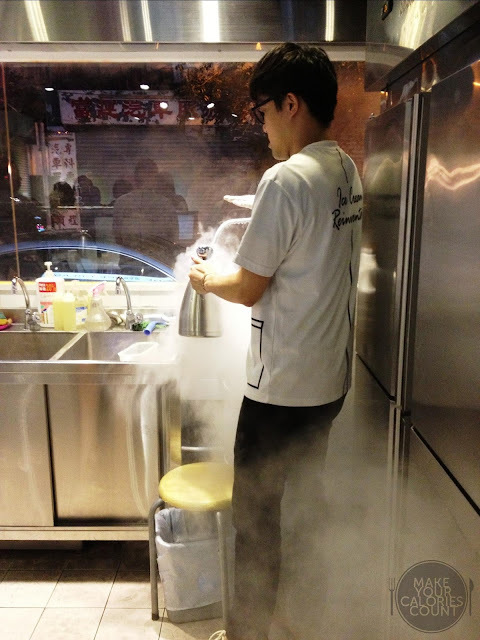 We first tried liquid nitrogen ice cream in London at the Chin Chin Lab but this was our first experience in tasting freshly made ice cream back in Asia. The number one question that struck us prior to trying liquid nitrogen food was "is it safe?". For most who are familiar with their periodic table, Nitrogen (with symbol "N" and atomic number 7) is a non-metallic element and nitrogen gas in fact makes up 78.1% of our atmosphere. It is non-toxic, non-flammable and it simply just evaporates into the air due to its extremely low boiling point at -195.8 degrees celsius. Liquid nitrogen ice cream is not quite exactly a new concept, but rather invented by the 'Queen of Ices', Agnes Bertha Marshall, an English culinary entrepreneur in the 19th century, with her first published cookbook in 1888. Arguably, we find that the best part about liquid nitrogen ice cream is that the ice cream is made fresh and right in front of you. 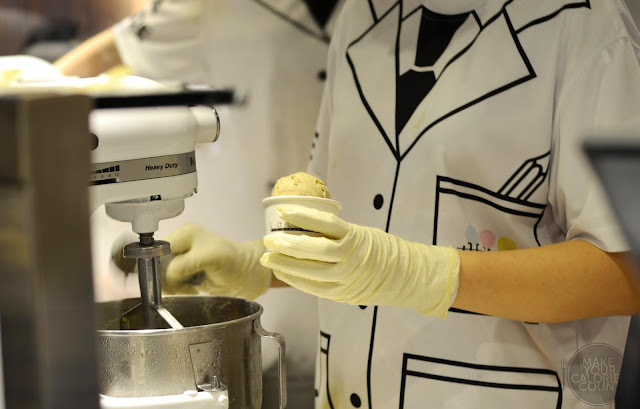 The quick freeze process where the cold nitrogen gas blasts over the liquid mixture results in no build up of ice crystals in the ice cream, which should give a smoother texture compared to normal ice cream, typically with added emulsifiers, stabilizers and preservatives to extend its shelf-life. 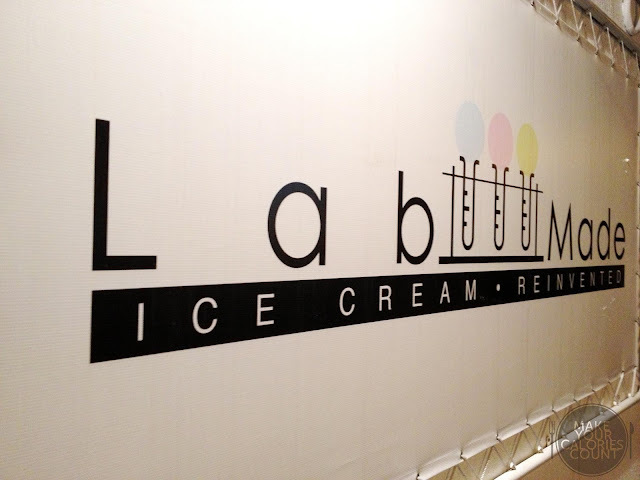 Without further ado, let us see if liquid nitrogen ice cream tastes better than normal ice cream indeed! The flavours were beautifully combined with the sea salt complementing the sweetness from the caramel. The balance in flavours was well-tipped and the icing was the fine chocolate bits in the ice cream to give it a gritty texture to the smooth ice cream. The ice cream was rich and cream and was quite addictive to say the least! I would not put much regard to just one piece of potato crisp dipped with chocolate, for it served more as a decorative item. The last time we tried a really good version of salted caramel ice cream was at the Daily Scoop in Singapore. Quite frankly, it was on hindsight after checking the menu again that we realized this ice cream should supposedly have lychee and rose flavours infused. 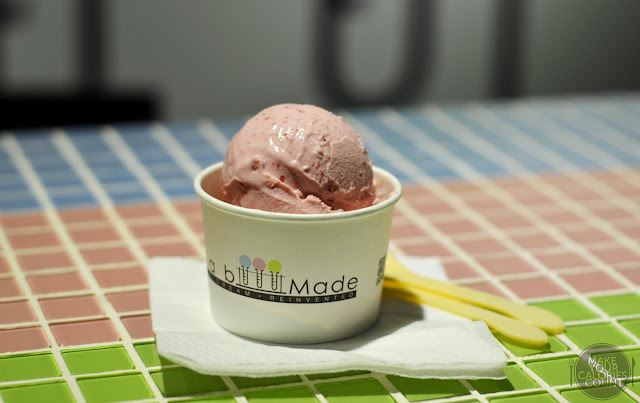 It tasted more like a creamy version of strawberry ice cream and what we liked about it was that we could taste real strawberry fruit pieces albeit very fine. The ice cream was velvety and smooth in texture too and overall, it was very palatable indeed. Apart from being a good rendition of strawberry ice cream, the lychee and rose flavours were sorely lacking if at all present. There was supposed to be a topping to go along this ice cream, but apparently they were out of stock! 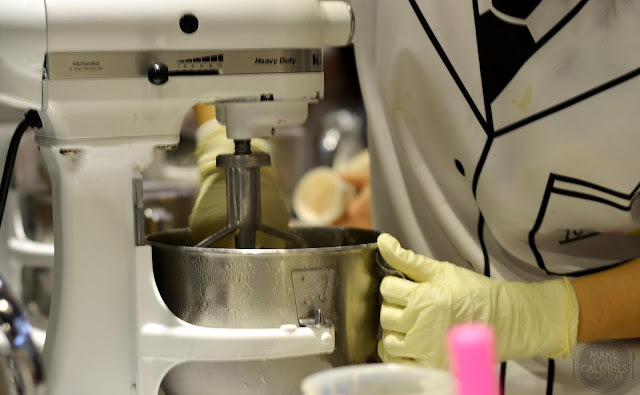 The first step was none other than to fill up the liquid nitrogen gas, which would be pour into the blender with the mixture solution inside and whiz it goes! Tada, it was really quite simple! 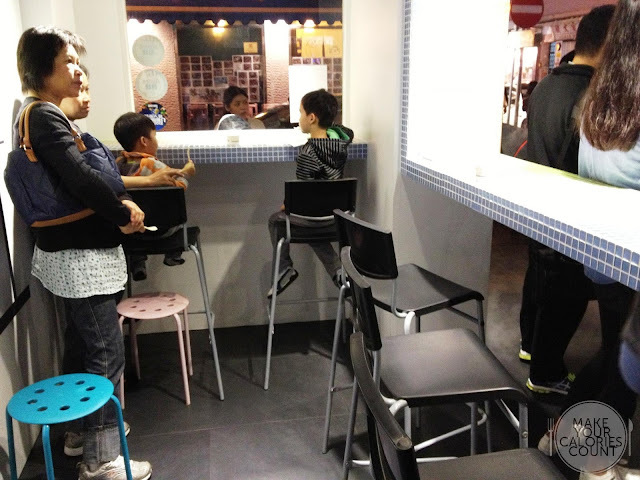 There was a little area for customers who wish to 'dine-in' though there were limited seats available. The bulk of the visitors simply made their orders at the counter and they would issue you with a receipt with order number enclosed. The majority of people would just crowd near the entrance and watched in awe as their ice cream were made fresh in front of them. When the ice cream was ready, your order number would be called out for you to collect. The service was acceptable despite the busy crowd. We found the ice cream to be slightly pricey, though it was about the same as the one we tried in London at £4.35. That came with some fanciful self-concocted topping which made it seem more value for money. Comparatively, it was definitely priced at a premium to what was offered at most ice cream parlours in Hong Kong, or even Singapore. 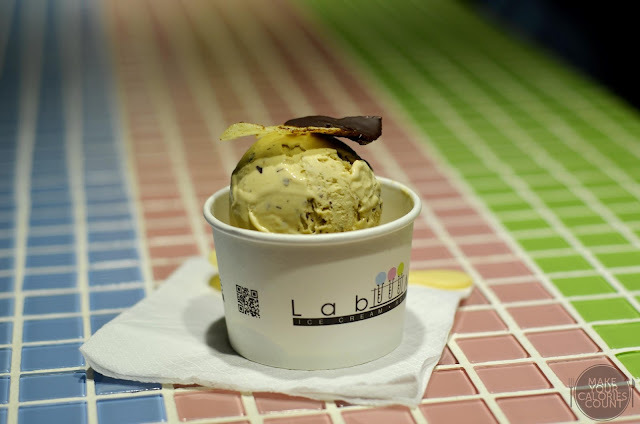 That being said, we were still drawn in by the quality of the ice cream so if we were in the vicinity of Tai Hang again, we would not mind dropping by for a cup of freshly made ice cream. Well, at the end of the day, when we asked ourselves if liquid nitrogen ice cream did taste better, we were not too sure ourselves. Apart from the gimmick of seeing your order freshly made before you, we were sure that it would be pretty difficult to taste the difference in a blind-tasting session. Nonetheless, a good ice cream is calories well worth in our humble opinion!